What a great event at Eat the Street last night! 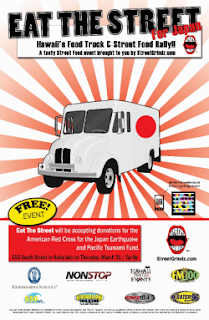 36 trucks and vendors dishing up some ono grinds in support Red Cross Japan Relief fund. About three thousand people showed up, generously expressing their aloha spirit in giving to the cause, it was truly admirable. We sold out in two hours of the 350 Grilled Portuguese Sausage generously donated by our man Steve at Kukui Sausage. We gave 100% of the $1,750.00 in proceeds directly to the relief fund. It felt good to be part of this relief efforts, to send out Aloha to those in need.